Your family will enjoy delicious goodness in every bite, with this simple but tasty meal. Even the picky eaters! In a large skillet over medium heat, cook beef chuck and onion until meat is no longer pink; drain and return to the skillet. Stir in corn, peas, ketchup, Worcestershire sauce and garlic powder. Reduce heat and simmer covered for 5 minutes. In a small bowl, dissolve bouillon in boiling water. Combine cornstarch and sour cream until smooth; stir into the beef mixture until blended. Add bouillon mixture and bring to a boil. Reduce heat, cook and stir until thickened. 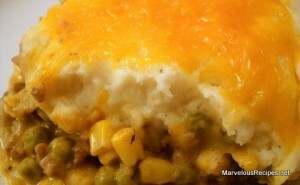 Spread mashed potatoes over the top and sprinkle with cheddar cheese. Cover and cook until the potatoes are heated through and the cheese is melted. Serves 6.